Our infant caregivers are trained to be attentive and loving with your baby. They use visual and vocal contact in their interactions with the children. The staff utilizes planned and spontaneous play activities throughout the day to reach the goals for the infant program. Caregivers allow each child to maintain their own unique schedules for eating, napping and playing. We know your decision of choosing care for your infant can be difficult. We, at Learning and Sharing, would like to make this decision easier for you. Please feel free to ask questions and visit with our staff at your convenience. 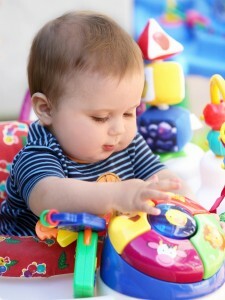 Our daycare for infants strives to meet every need of your ever-changing baby. The staff create weekly goals for each child to work towards their growth in the following areas: Creative Thinking and Expression, Health & Safe Practices, Gross Motor Coordination, Fine Motor Development, Language & Literacy and Social & Emotional Development. The staff communicate with the parents daily and meet with them at least three times a year to review their assessments and discuss future goals. Together, we help your child reach their maximum potential!